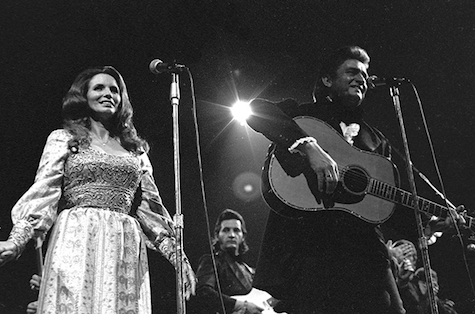 Because I don’t have a photo of Conor Oberst and Corina singing at O’Leaver’s, here’s a photo of Johnny Cash and June Carter Cash. The Live @ O’Leaver’s session released to the world yesterday happened on Jan. 3, 2016, a Sunday night followed by a workday Monday which kept me from seeing it live. No matter. I have these recordings to mark the date of my absence due to responsibilities (T’was a time, my friends, t’was a time…). Dolores Diaz & The Standby Club featured Matt Maginn (Cursive), Dan McCarthy (McCarthy Trenching), Ben Brodin, Phil Schaffart (Con Dios), Miwi La Lupa, Roger Lewis (The Good Life), Mike Mogis (Bright Eyes) and Conor Oberst. Fronting the band was Conor’s wife, Corina. The fact that Corina was the front-woman was hush-hush at the time. Not sure why. Who knows the motives behind celebrities and their fragile psyches? Keep in mind, Oberst had been married for years before he acknowledged it in the press, a secret to all but his friends and family. One could argue that’s how it should be. Anyway, for some, this show was a sort of coming out party for Corina. For most, this was a return for Conor, who disappeared from the music world last fall at the beginning of a Desaparecidos tour, stating illness and exhaustion. The details on that also are shrouded in mystery, along with the current status of Desaparecidos, though at least a few of the members have moved onto other projects. Denver Dalley will be touring with Har Mar Superstar again; Landon Hedges is said to be completing a new Little Brazil album. And Oberst, who turns 36 next Monday, continues to lie low, though he was spotted in the crowd at a recent Creighton basketball game (via Facebook). Only he knows what he’s working on next. For now, we have these recordings. Oberst sings lead on two tracks. The first is a cover of a Randy Newman song called “Jolly Coppers on Parade,” from the 1977 album Little Criminals. The other is a cover of Nitty Gritty Dirt Band’s “You Ain’t Goin’ Nowhere.” I have to believe there are rights issues with these and the other songs (which are all covers). All the more reason to listen to them right now. Not to be overshadowed by the Diaz release is another set recorded the same night from Johnathan Rice. Good stuff. As of this posting (at noon), tickets were still available to tonight’s Godspeed You! Black Emperor show at The Slowdown. As with all Godspeed shows, this should be a mammoth production. I think the last time they played in Omaha was at The Music Box, a show that I’m told was so loud it killed fish swimming in the nearby Big Papio Creek. Opening is Xylouris White, described as “Master of Cretan lute, George Xylouris, and Jim White a most innovative and charismatic drummer.” Ruffled attire optional. This one starts at 8 p.m. and is $25, while tickets last. Dude. You Ain’t Goin Nowhere is by Robert Zimmerman. C’mon dude!